Our knowledge and expertise along with our esteemed reputation around the world, has given us the power to purchase the best and highest quality materials. Modern Room Remodels is New Jersey's most reputable, trusted, and experienced Tiling & Remodeling Contractors. Professional artisan installers of fine ceramic tile, porcelain, glass, natural stone, marble, granite & Gauged Porcelain Tile Panel, Thin Tile, Porcelain Slabs Modern Room Remodels is a flourishing business built on honesty, professionalism, and integrity. For over 30 years in business, MRR based its business on "Excellence". Our success has been through our attention to detail, competitive pricing, while delivering our masterful work motto "The Art of Perfection" We have become an established symbol in the the industry for quality workmanship, expert tailored installs, and exceptional customer service for home owners businesses and contractors' alike. Our first in class installation experience, will help you add character, elegance, and charm to any room in your home or business. Modern Room Remodels Marble and Tile Installation has built its business mostly through word of mouth. It was founded in Belleville, New Jersey. Our service extends to homeowners, businesses and contractor's in the central/northern and coastal parts of NJ and NY. And now, for the first time in Modern Room Remodels Marble and Tile storied existence, we are now delighted to showcase our work to the world, with our Houzz page! Features: Custom catered design outlays, interior decorator coordination's, custom shower mud pans, level cement/mud floors, back splash, accent walls/floors, and much more!!! Bathroom & Kitchen Remodeling - NJ HIC (NJ Home Improvement Contractor) Licensed and fully insured Most importantly we live by our code - "Do the work the right way, THE FIRST TIME" Many cut corners and offer the most sub-par material to save a buck or two. Here at Modern Room Remodels, the only corner we cut, is to get ahead and deliver our promise to satisfy each and one of every customer of ours, well beyond their wildest expectations. Alpha & Omega Stone is a state-of-the-art fabrication shop in Northern New Jersey. We pride ourselves on our customer service and workmanship. Our projects range from residential kitchens to commercial high rises. We work with natural stone as well as Quartz. Tile, stone and countertop projects might not sound especially complicated, but they can be surprisingly hard to get right. Seeking expert assistance can help homeowners save time, money and frustration. Contractors who specialize in this field are trained to install and repair tile and stone surfaces in your Orange home, from flooring to backsplashes, as well as countertop materials such as solid surface, granite and marble. In addition to basic surfaces, many Orange, NJ tile, stone and countertop contractors can create and install murals and mosaics, as well as add decorative edge treatments to countertops. They also repair or replace surfaces in the event of chips, cracks, stains or other damage. Many tile, stone and countertop professionals also install shower pans, radiant-heat flooring systems and other common components of surfacing jobs, often working in tandem with Orange, NJ plumbers or other professionals. Here are some related professionals and vendors to complement the work of tile, stone & countertops: Interior Designers & Decorators, Architects & Building Designers, General Contractors, Kitchen & Bath Designers, Design-Build Firms. Find a tile, stone and countertop contractor on Houzz. 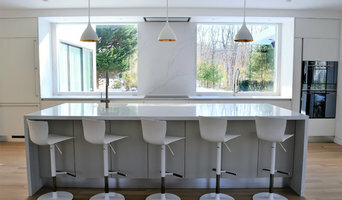 Narrow your search in the Professionals section of the website to Orange, NJ tile, stone and countertops. You can also look through Orange, NJ photos to find tile, stone and countertop projects you like, then contact the contractor who worked on it.